Introduction: Laparoscopic splenectomy is an effective treatment for most patients with Idiopathic Thrombocytopenic Purpura (ITP). Patients in whom the response to treatment with splenectomy is incomplete or those who develop recurrence of symptoms should be evaluated for the presence of accessory spleen (AS). The effectiveness of laparoscopic excision of accessory spleen after previous splenectomy for ITP is not clear. 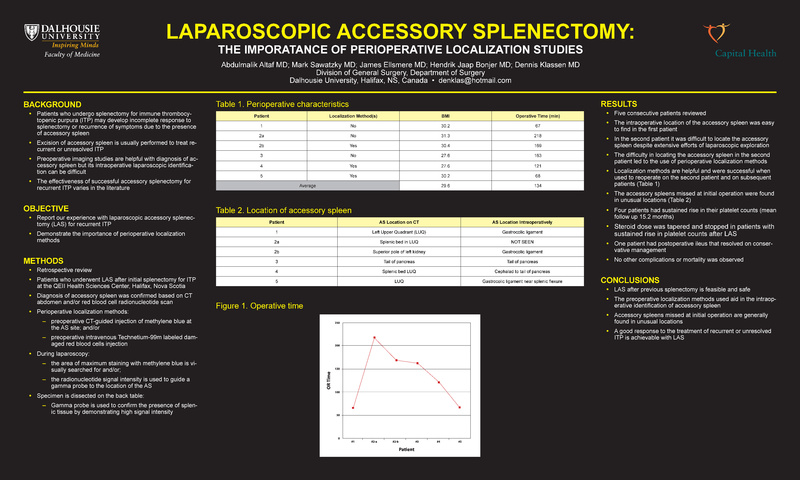 We report our experience with laparoscopic accessory splenectomy (LAS). Methods: We reviewed five consecutive patients who underwent LAS after initial splenectomy for ITP at a tertiary care center from 09/04/2003 to 15/7/2007. Demographics, hematological disease, preoperative diagnostic and localization studies, technical success and the effect on ITP in the form of postoperative change in blood counts were examined. Results: Five patients with recurrent ITP underwent LAS during the study period. All had successful removal of the AS based on final pathological exam. One patient required a second exploration with localization after a failed attempt without. A novel method of localization was used in 4 operations. This consisted of computed tomography-guided injection of methylene blue at the AS site preoperatively and/or preoperative intravenous Technetium99 labeled damaged red blood cells. Intraoperatively, dye is used for visual identification and the gamma probe is used to aid in localization or to confirm the presence of the AS within the excised specimen. We found these methods very helpful in the intraoperative identification of AS. Four of the five patients had sustained improvement in platelet counts after LAS. Conclusion: LAS after previous splenectomy is feasible and safe. Preoperative localization methods aid in the intraoperative identification of AS. Good long term treatment of ITP is achievable.